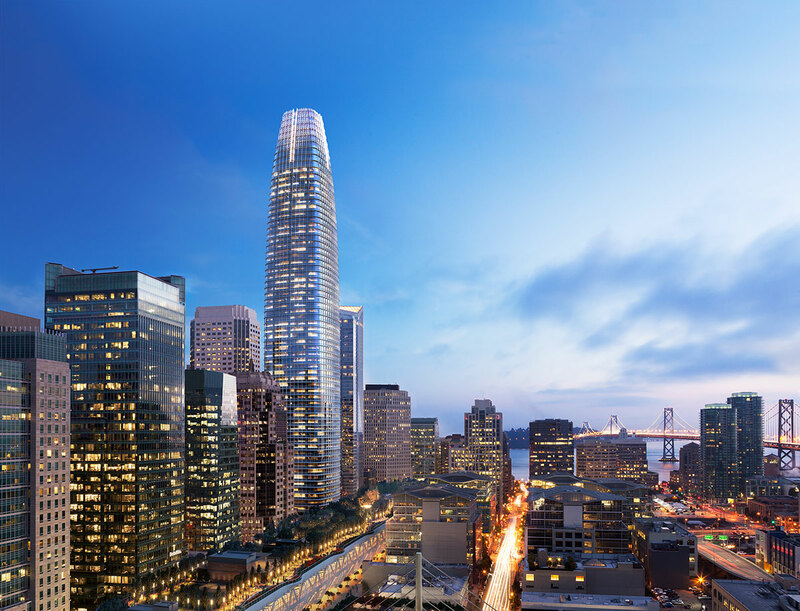 Rendering of Salesforce Tower, designed by Pelli Clarke Pelli. SAN FRANCISCO – Salesforce Tower, which is under construction in San Francisco, has surpassed other towers in height to become the tallest building on the West Coast. Hines and co-development partner the Boston Properties REIT, announced that on Friday, October 14, 2016, Salesforce Tower will officially be the tallest building in San Francisco. Soaring to new heights – Salesforce Tower surpasses the famous Transamerica Pyramid at 853 feet when it reaches 867 feet on Friday. The building will continue to grow another 200 feet until it reaches 1,070 feet. Located in the Transbay District at 415 Mission Street, between Fremont and First Streets, the 61-story Salesforce Tower occupies a full city block and marks the new center of San Francisco. Construction for the 1.4 million SF Salesforce Tower began in 2013. The fifth floor space opens onto the Transbay Transit Center’s 5.4 acre rooftop park. Boston Properties owns a 95% interest in the project and Hines owns a 5% interest. The architectural team is led by design architect, Pelli Clarke Pelli and Kendall Heaton as the architect of record. The building will be completed late in 2017.